Bahamas Telecommunications Company says new next-generation network and mobile services will be rolled out across the entire country by mid-2012, with 50 new stores nationwide. 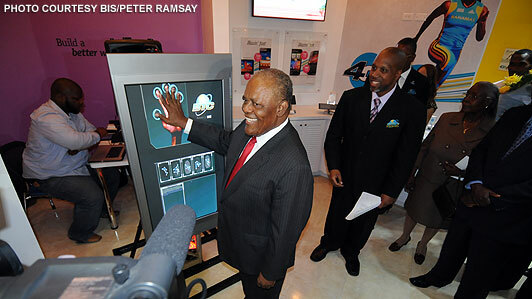 Pictured: Prime Minister Hubert Ingraham places his hand against a screen to launch BTC's 4G network. Bahamas Telecommunications Company Ltd (BTC) officially launched its 4G network and new flagship store on Monday. During a ceremony held December 5 at the new outlet at the Mall at Marathon, Prime Minister Hubert Ingraham launched the high-speed telecommunications network by placing his hand on a touch-screen display to symbolically activate the 4G technology. Also in attendance were members of the Cabinet, directors, dignitaries, union leaders and about 100 invited guests. Activities celebrating the grand opening are set for Saturday December 10, with entertainment, Junkanoo, stilt walkers, artists, musicians and other activities. “We at BTC look at this as not merely a new store, but the beginning of a new chapter in BTC history; a chapter in which the way we communicate, engage with each other socially, handle business and banking transactions changes,” said BTC chief executive officer Geoff Houston at the store’s opening. The launch of 4G follows a $43-million capital expenditure in the network and a $55-million investment in next-generation network (NGN) technology, the platform which boosts all of the nation’s telecommunications capabilities. The Nassau store is the first of 50 planned for the country, with another opening scheduled for December 12 in Grand Bahama, when the major population centres of that island will also experience 4G. Complete penetration of high-speed mobile and Internet services in the Family Islands is slated for mid-2012. Houston said the extensive retail footprint will create numerous entrepreneurial opportunities for Bahamians. Prime Minister Hubert Ingraham spoke at the opening ceremony of the new flagship store of Bahamas Telecommunications Company Ltd (BTC) on Monday. Read his address here.